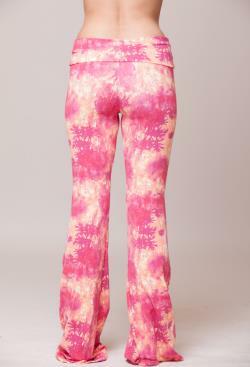 Women's dancing pants in a unique, colorful, cheerful print, made from exquisite fabric that leaves the competition behind. A comfortable dancing pants feels like a second skin, as you dance or work out. Wear these pants with a pair of flip flops on a summer's day, or tucked into a pair of winter boots these pants are always fashionable. Note: the prints change every once in awhile. Fabric's main features: lightweight, soft, easy-care. It provides thermal comfort by balancing your body heat, moisture wicking. Washing instructions to guarantee your pant's longevity: hand wash in cold water, you do not need to use fabric softner.